SIDE A: Really enjoyed this work, has listened to the criticisms of it, thinks they have some validity, but do not detract from the value of the work overall. It was fun to read/watch. They will own (or do own) a copy of it that they will return to often. SIDE B: Sees nothing but the "negative" message in this work and will not stop telling everyone they see about it. Blog post reviewing the book/movie/show? MUST COMMENT. Tweet about how much it was enjoyed? MUST RESPOND PUBLICLY. Saw something on facebook that referenced the book/movie/show? MUST COMMENT AND RESPOND TO ALL OTHER COMMENTS WITH ANGER. Now, with both of these things (one was a movie and another was a book series), I have to say that I genuinely see what critics are saying. Their views have merit, and they aren't wrong. But they are 1. Blowing it out of proportion 2. Focusing on the minutiae instead of the overall message/tone/context. That's part of what's wonderful about art, isn't it? We all can read the same book, and we will all come away with different messages. We can watch the same movies and shows and take a different piece of it into ourselves. Great art - whether it's written or performed or captured in a frame - works on an infinite number of levels and speaks to an infinite number of situations. In high school, I was obsessed with the musical Les Miserables. (I didn't read the novel until college) I remember talking with a friend of mine about it, and he said that he liked how this play reminded him that we needed to take care of the poor and the needy. AND HE WAS SO WRONG I ALMOST STOP BEING FRIENDS WITH HIM. But while he was totally and completely wrong (because Les Miserables is a parable of justice and mercy in action - duh! ), he was also totally and completely right. There is no wrong way to interpret a work of art. 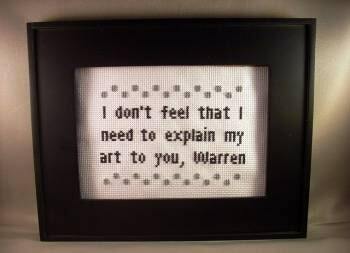 You have no right to tell other people how to interpret a work of art. You have no right to tell other people that their personal interpretation of a work of art is wrong. Because that's the whole point of this writing gig - to put a story down on paper. To bleed and die a little on every page, and to hope that someone, somewhere sees something they identify with, too. In order for that to happen, though, there needs to be an infinite number of interpretations and applications. I, for one, am grateful that we have the chance to even have this discussion. That an endless world of books sits before us, ready to be read and experienced and discussed. This is true. I was just surprised to see the same theme cropping up in a dozen different arguments, in several varying corners of the internet (that don't normally intersect). Nope, Gina. You are so totally wrong. About everything. :) (Just kidding.) Although now I'm dying to know which series and movie you're talking about, and I think it's awfully mean of you to not tell us. See me sticking my tongue out at you? That's because I'm really really mature. Kind of like a fifteen-year-old.